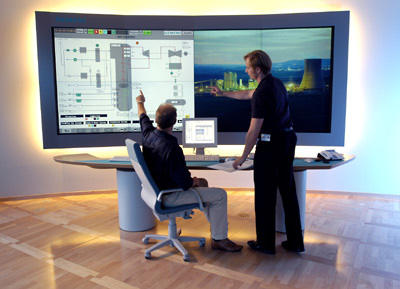 In a recent Siemens press release they're showing off their, "Remote Expert Center for Power Plants in Karlsruhe, Germany" but one can't miss the awesome monitor they're standing in front of. Which only leads to the question, "Where and how much?" Pretty nice ... although I suspect (but could be wrong) that it is not a monitor. It looks like a snap-on type of screen onto which you project with a DLP type of projector ... the split images can be generated with visual switching equipment etc. No kidding! And, "What's the res on that?" Actually only 1400 x 1050 - the thing about it is that you have the capability for multiple screen shots on one screen that many people can look at at the same time. Hey, I added you to my Vermont blogroll at 7d.blogs.com/802online. Let me know if you want off. Or if you're no longer in VT.